For centuries philosophers and theologians have asked whether and how it is possible to talk about God. The shared answer to this question goes by the name of “analogy,” which recognizes both similarity and difference between the divine being and human language. In the twentieth century, Karl Barth, Erich Przywara, Hans Urs von Balthasar and Eberhard Jüngel explored this question in new and controversial ways that continue to shape contemporary debates in theology. In The Analogy of Faith: The Quest for God’s Speakability, Archie Spencer examines the problem of analogy in its ancient, medieval and modern forms. He argues for a Christological version of Barth’s analogy of faith, informed by Jüngel’s analogy of advent, as the way forward for Protestant theology in answering the problem of God’s speakability. 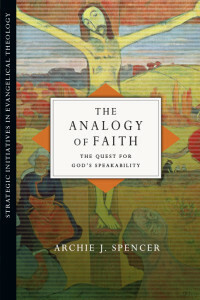 The Regent College Bookstore is pleased to present an evening public lecture with Regent faculty member Archie Spencer to celebrate the release of his book, The Analogy of Faith: The Quest for God’s Speakability. The book will be published by InterVarsity Press and be available in October 2015. A book signing will follow the talk.